Click on an area below to connect with local biodiversity resources. Innovate, collaborate and create healthy biodiverse places and spaces where people and nature thrive. St. Louis boasts an impressive group of non-profit conservation organizations that specialize in niche ways – plants, birds, insects, prairies, wetlands, and more. Together, these groups serve as a network of support to help our shared region become a better place for humans and wildlife. The Missouri Prairie Foundation's Grow Native! program works to protect and restore Missouri's native prairie biodiversity in the urban, suburban, and rural environments. Explore the links below to learn about local conservation organizations and how you can take part. 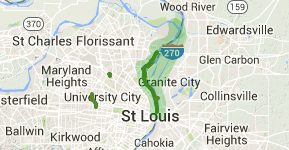 BiodiverseCity St. Louis recognizes our region's reliance on biodiversity, the variety of life, and natural systems. We depend on biodiversity, not only for the air we breathe, the water we drink, and the food we eat, but also for the basic health, livability and economic prosperity of our region. In this thought-provoking book by University of California, Berkeley professor Carolyn Finney, the topic of who should and can have access to natural spaces is critically examined through the lens of environmental history, cultural and race studies, and geography. With an eye on the future, the author highlights the work of African Americans who are opening doors to greater participation in environmental and conservation concerns. On Saturday, May 9th, this site will come to life with a free festival of music, food and drinks for purchase, historic reenactments, and fun for all ages. Along with Frederick Douglas and Abraham Lincoln, a team from BiodiverseCity St. Louis will engage attendees about urban green spaces and invite event-goers of all ages to personalize native wildflower seed packets for Mother’s Day.